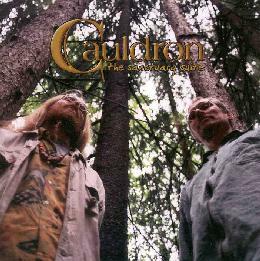 Cauldron - "The Sanctuary Suite"
Cauldron is yet another member of the musical family that includes Sweden's Spacious Mind and Holy River Family Band. This time it's the duo of Jens Unosson (Spacious and Holy River) on organ, synthesizers, trumpet, and belltree, and Arne Jonasson (Holy River) on electric and acoustic guitars, bass, sitar, nychelharpa, pumporgan, saxophone, harmonica, tablas, and percussion. The Sanctuary Suite consists of four psychedelic instrumental tracks which the liner notes say are songs based on musical sketches by Jens and Arne (two from each musician). "The Sea/The Road" is a 20 minute extended piece in which Arne plays simple but trippy psychedelic guitar solos against Jens' synth textures, waves washing up against the shore, and screeches that are like the sounds that whales make. This is neither intense nor complex. Just very ambient, psychedelic soundscapes which serve as ear candy for the listener. During the last five minutes a bass is introduced creating a sense of rhythm and the guitar picks up the pace a bit, jamming along with a harmonica. It's got a bit of a Reggae feel, the music having developed into an upbeat, almost danceable number. "The Cathedral" opens with similar guitar soloing, but includes intense rapid keyboard work. Part of it sounds like bagpipes, and there's a single droning note that is maintained throughout the track that I could feel deep in my chest like you get from a heavy pounding bass. A tribal drum soon sets the rhythmic pattern while the guitar gets a bit more cosmically potent and the bagpipe synths hit the higher registers. I enjoy Arne's guitar soloing for his ability to play slow simple guitar solo lines that still manage to be wildly intense. "The Cathedral" also includes freakout sitar and Jens let loose with an array of spaced out synth sounds. "The City" is an Eastern influenced slide sitar workout played against a backdrop of bonging cathedral bells and subtle keyboard textures. Not by any means ambient and best not played in the same frame of mind as when listening to "The Sea/The Road", but a great exercise in jarring one's brain. "The East/The Dream/The Bliss" is similar to "The City" but more overtly Indian influenced. The sitar goes into the stratosphere to produce some of the wildest Eastern influenced psych I've heard. We then move into a segment that includes throbbing synths, organ, tablas, trumpet and sax, and jazzy guitar to go along with the trumpet and sax. The whole thing gets very Miles Davis in a kaleidoscope way and is the most stylistically different tune I've heard from these guys' various band projects. Jazz for psych fans touring the Taj Mahal! If you're new to the whole Spacious Mind/Holy River family then I would recommend starting with any Spacious Mind album or Holy River Family Bands' second release "Welcome To Riverhouse". But veteran fans of those bands will enjoy the variety on Cauldron and find it a welcome new release from these masters of mind expansion. For more information email The Wild Place at aceofdiscs@aol.com.